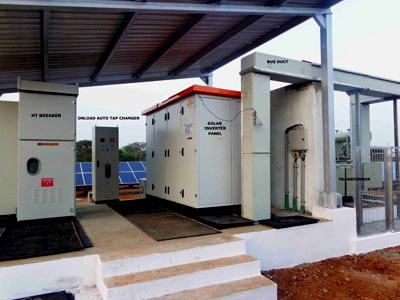 The Switch successfully commissioned its 1 MW single module PVI 1000 solar inverter for Ultra Cosmic Solar Energy, a newly established Indian solar energy company. The Switch PVI 1000 solar inverter series features a totally sealed power and controls enclosure section rated IP65/NEMA 4. The inverter panels are installed outdoors on a simple concrete foundation. The inverters have a built-in, totally self-contained cooling system with no need for external cooling water or refrigerant. Therefore it is self-sustained; no site plumbing or external auxiliary power supply is required.